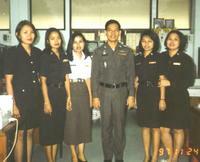 In recent times, you may have heard, or read, various different reports with regards to security in Thailand. The political events in Thailand have reached the world news and give an image of the country that may be more sensationalism than reality. As such, I have taken the liberty of explaining the situation as well as a more general view of security and safety in Thailand. I would like to highlight that this is my totally independent and unbiased opinion, and its purpose, is to simply give you as much information to assist you in planning any holiday and deciding whether or not Thailand is right for you. I will split this post into 2 parts. The first part gives a general overview of security in Thailand while I will discuss specific current events tomorrow. First of all, one very strong statement I would like to make is that I consider Thailand an extremely safe place for tourists to travel. For many years now Thailand has been considered one of the leading tourist destinations in the world, and this remains no different today. Because of its popularity, Thailand supports a huge tourist industry, and is very dependent on this for much of its revenue. As mentioned in my post last week there is an excellent infrastructure in place to support this, and a worthy reputation for extremely safe travel. Outside golf vacations, it is very popular with families and single tourists alike due to this excellent reputation. Being a predominantly Buddhist country, the Thai people are very peaceful by nature, and tend to avoid confrontation at all costs. In the Buddhist philosophy, it is wrong to cause harm to others, and certainly not to act in a violent manner. In all the time I have spent in Thailand, I have personally felt safer than any time I have spent in any city in the United States. The warmth and the generosity of the Thai people never ceases to amaze me, and I find it most refreshing compared to other countries.